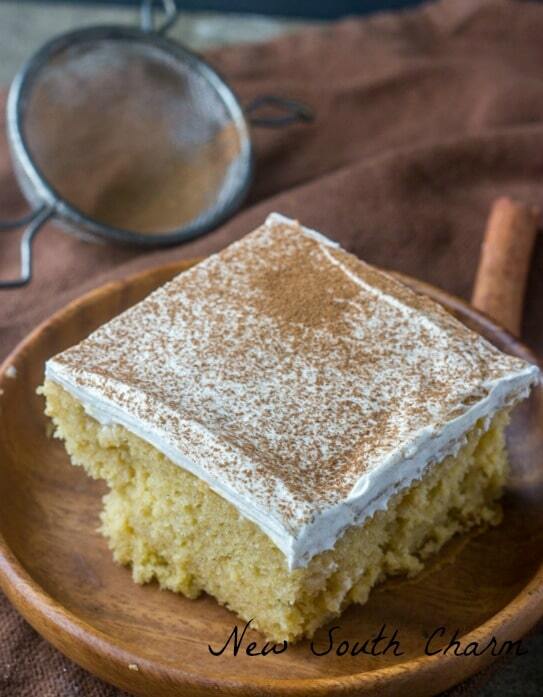 If you love the cinnamon, gooey goodness of snickerdoodle cookies then this Snickerdoodle Poke Cake is for you!! Snickerdoodles are one of my favorite cookies so how could I not love a cake with all the same great flavors? I promise this cake did not disappoint! The combination of the sweet cake with the flavor of the spicy cinnamon made me love this Snickerdoodle Poke Cake as much as the cookie! Poke cakes like this Chocolate Turtle Poke Cake or this Strawberry Vanilla Poke Cake are super easy to make. 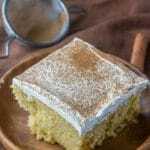 This Snickerdoodle Poke Cake was no exception. Starting with a yellow cake mix you just add a few simple ingredients and becomes a flavorful moist dessert that feeds a crowd and is perfect for a family gathering or a potluck. 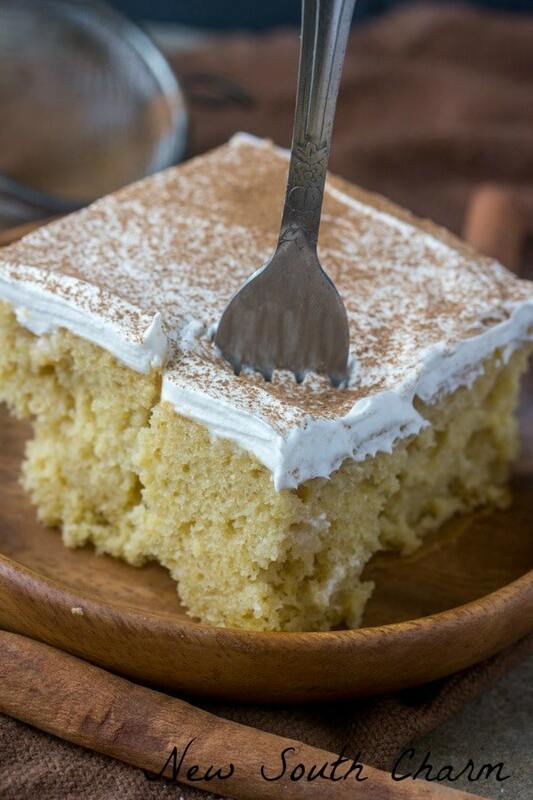 This Snickerdoodle Poke Cake Recipe combines yellow cake mix with water, oil, eggs, vanilla extract and ground cinnamon in a large bowl with a mixer on medium speed. Then transfer the mixture into a 9×13 pan and spread out evenly. Then place in a 350 degree oven for 20 minutes or until a toothpick inserted in the middle comes out clean. Set the cake aside and allow it cool completely For me this was about 30 minutes. Once the cake is cooled use a skewer to poke holes about a half inch apart completely through the cake to the bottom. Then pour the condensed milk over the top and spread out with a spatula so that the liquid goes into the holes poked in the cake. Next top the cake with defrosted whipped topping and then place in the refrigerator for an hour. Sprinkle on more ground cinnamon and serve. 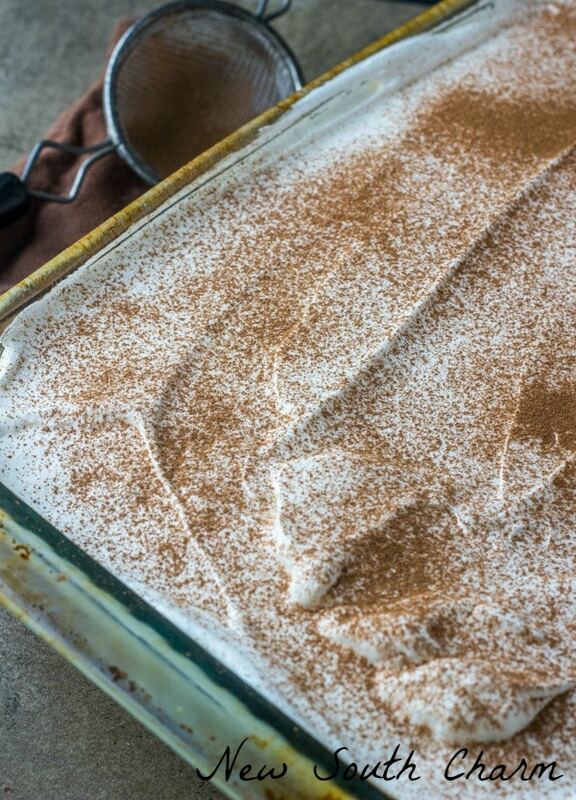 That’s all there is to it making this Snickerdoodle Poke Cake! So easy but so good! Looking for more desserts you can make from a boxed mix? Check these out!! In a large bowl combine cake mix, water, oil, eggs, vanilla and cinnamon on medium speed until smooth. Pour into baking pan.